Our tour today was at a much more reasonable 10am. We got up and headed to breakfast at the Neve Restaurant. They offer both a buffet option and a la carte choices. We went with the buffet which was quite extensive. There was a cold area with fruits and yogurts, a hot section with breakfast meats and made to order eggs, and a bread section. They also had a smoothie bar. Everything we had was good. Our snorkeling excursion was a 3 hour trip booked through the hotel concierge on Leeward Island Charters. You can choose to do a private charter or the normal excursion which is what we chose. We met on the dock and there were about a dozen other people on the tour with us. Soon the catamaran pulled up. It was a beautiful boat with a big open, netted area at the front. 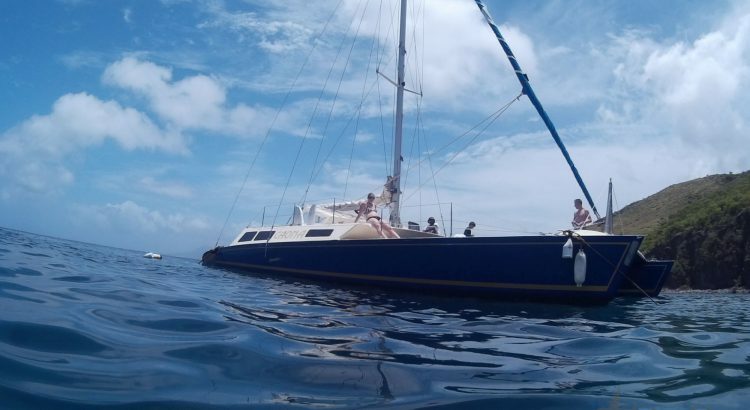 The captain also said that his family built the catamaran by hand on St. Kitts which was very impressive. Once we boarded, the trip was open bar with beer, rum punch, sodas, and water. It seems to be a trend here with boats and free-flowing drinks. It took about an hour to get over to the snorkeling area which was a cove off of St. Kitts. It was not the best snorkeling I have ever done, but the water was crystal clear and there were plenty of coral and fish to see. I’m definitely spoiled in the snorkeling department. We had about an hour to snorkel and then it was time to head back to Nevis. It had gotten quite rough in just the short time we were snorkeling. The waves were coming up through the netting on the front of the catamaran. I really enjoyed the tour. There is something special about being on a catamaran with the sails and netting on the front that makes snorkeling so much better. Once we got back, we got lunch at the cabana again. Then we went over to the adults-only pool and found some loungers for the rest of the afternoon. Once again the service was great with the pool attendant bringing around water and fruit every so often. In addition, the bar manager in the bar nearby was a great guy and would bring a pitcher of rum punch on a floating turtle into the pool every so often. For dinner, we walked down the beach and went to Sunshine’s as we did not try the world famous killer bee drink last time. I had fish and Samantha had the shrimp. Both were good, but you could tell that they were due for a restock as the salads were pretty small and they were out of some of the menu options. Word of advice: if you see something you want, order it that day because it might not be there then next time you go.